It’s time to kick off spring with an UU ACM-W chapter meeting! The meeting is open for everyone! You are welcome to come if you just want to listen in or if you have some ideas for upcoming events. Data Dugouts (www.datadugouts.com) was designed to connect technology practitioners with startup and midsize sports and media industry companies. The purpose of the contest is to help gauge the interest of engineers and programmers into considering these industries for employment opportunities. The theories presented by contest participants will help both industries in their future recruiting efforts (NOTE: Companies will begin to set up profiles and list internship opportunities in February). 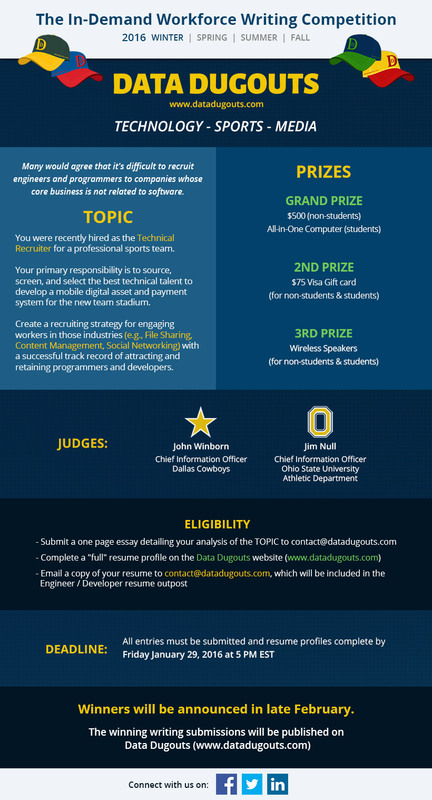 The contest judges are the Chief Information Officers of the Dallas Cowboys and The Ohio State University athletic department. Click the photo for information on the IN-DEMAND writing contest.